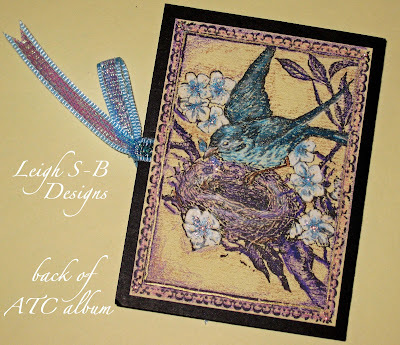 Velvet Paw Creations: Mini ATC Grunge Collage Album featuring Blockheads Stamps! 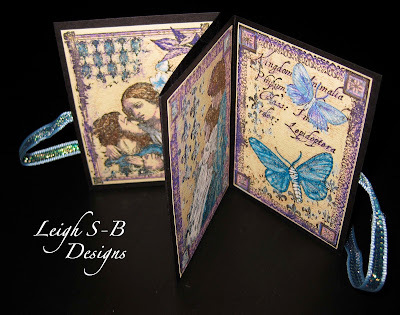 Welcome to Velvet Paw Creations - Design Team Projects by Leigh Snaith-Brunton - The Sharpie Domino Queen & owner of LeighSBDesigns Art Stamps! 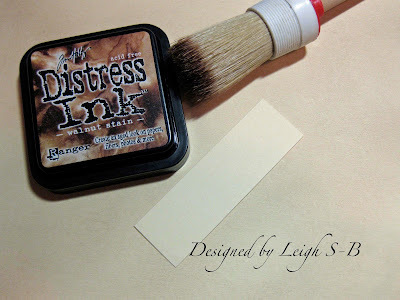 Rubber Stamps by Leigh S-B & Gallery! 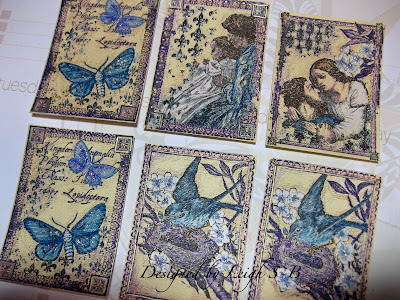 Mini ATC Grunge Collage Album featuring Blockheads Stamps! Here's another project tutorial I designed for Blockheads Paper Arts! I started off by stippling Walnut Stain Distress ink onto dark cream cardstock to grunge it up a bit so it's not so bright. 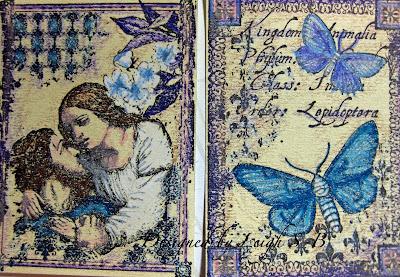 You can see in the photo I put a piece of the original cardstock on top so you can see the difference the stain makes. I worked on all six collages simultaneously applying the various colours and adding shading with same colours by varying how hard I pressed and just going over and reworking all the areas. I blended some areas with the white pencil too. The following photos show the progression and build up of colours. I used a combination of White, Peacock Blue, Indigo Blue, Light Cerulean Blue, Violet, Blush Pink and Sienna Brown on all of the collages. The style of the collages makes them a set already but my colour continuity through out further pulls them together. 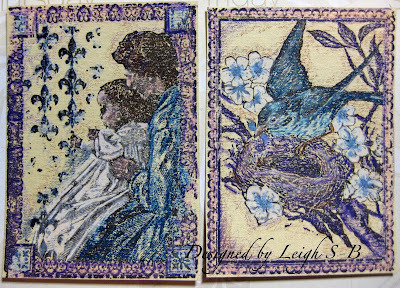 I then cut them out using the standard ATC dimensions of 2.5" x 3.5". I added touches of gold to the squares on some of the frames, the frame points on the Romeo & Juliet collage and broken lines around the Bird Nest collage frames with a fine point PrismaColor metallic gold paint pen. I was going for the illuminated look of drawings in old manuscripts and I love the way these turned out! I decided to add a touch of sparkle to each collage with diamond glitter glue too. It was hard to capture the sparkle of the glitter but I think you can see it a bit in the photo above and better in the one below. 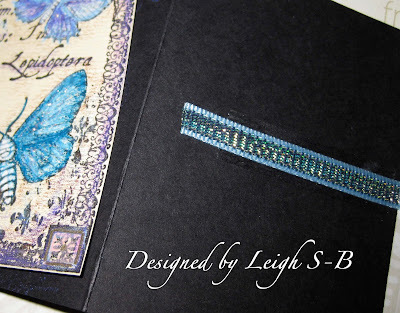 I put them aside to let the glitter dried and made the mini accordion album. I based my measurements on the standard size of an ATC and cut a piece of black cardstock to 3.75" x 11". Score fold lines at 2.75", 5.5" and 8.25". Fold the accordion album so that the first fold is a valley fold, the second a mountain fold and the last a valley fold. 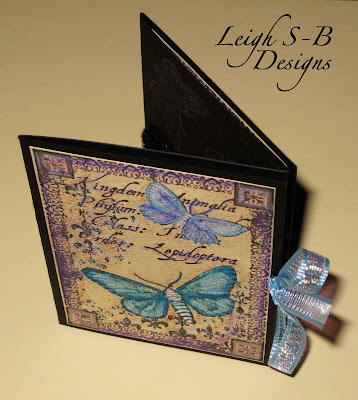 The dimensions of each panel of the accordion album is 3.75" x 2.75". 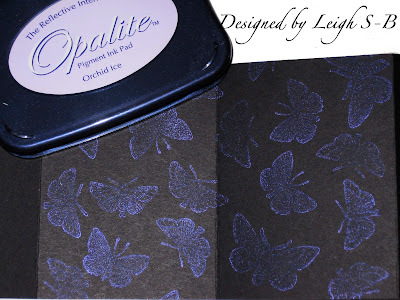 Turn the album over and stamp a collage of the 3 individual moths that come with the ATC set with Opalite Orchid Ice ink onto the two middle panels. 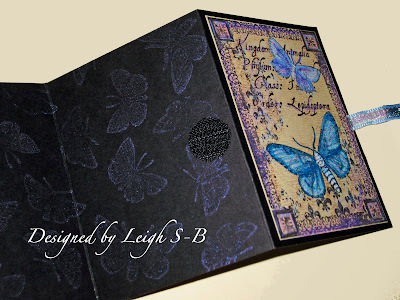 The iridescent interference purple ink is stunning on black cardstock! It was also hard to capture it just right in the photo but you can see what I mean. While the ink dried I cut two lengths of a beautiful pastel blue iridescent metallic ribbon that I got from Michaels to make the closure for my mini album. I adhered the ribbon to the outside of the front and back panels with double-sided sticky tape. 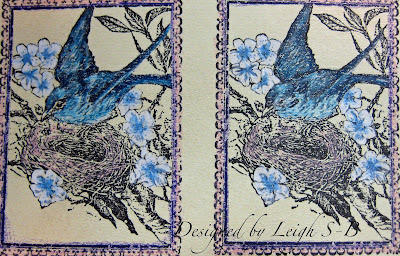 Then I added one of the Moth ATC's to the front cover and one of the Bird Nest ATC's to the back cover with permanent adhesive tape. 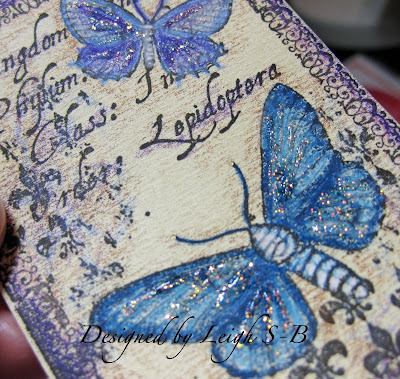 I then adhered the remaining ATCs to the inside of the album! My mini album can be displayed in a couple of different ways. 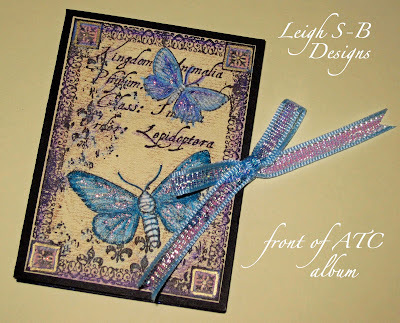 Folded in half so that the album forms a gate fold with the ribbon tied in a bow. Standing with the album closed and the ribbon tied in a bow. Or standing but with the 'pages' of the album attached at the spine with the aide of a black velcro dot I adhered to the back of the middle panels. Finally it can also be displayed flat as a closed mini album book with the velcro holding the pages together and the ribbon holding the book closed. So many possibilities! For more Blockheads inspiration pop on over to Karen's blog if you haven't seen her Faux Batik technique projects yet! Love it!!!! Your coloring is so, sooo great. Love the folds. I am inspired to try one of these books. Another super amazing project!!! Fabulous! 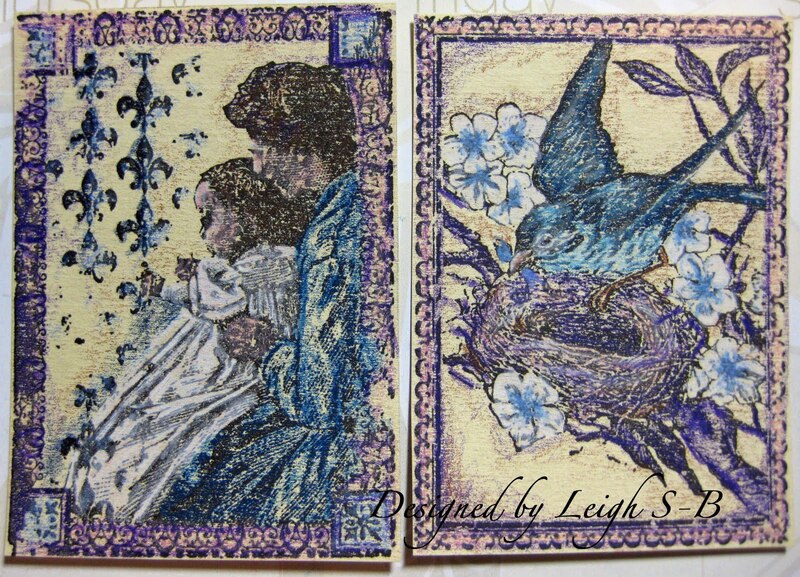 Love that you used stippling (an old, old technique) which we do not see much anymore and used a new ink. Leigh, as always, you excel. Thank you for visiting and leaving me some love, your comments are most appreciated! I now have my own stamp company! Follow for lots of inspiration, New Release news and more! Save the date for 2019! Poe Appreciation Day Blog Hop! 5 days of celebrating all things POE! Join us Jan 19-23! See u in 2019! Join us for lots of fun & specials! Get Velvet Paw Creations direct to your inbox! 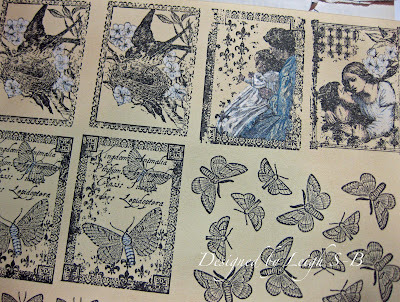 Store You Cling Mounted Stamps in Style! My Art and Tutorials are provided for your inspiration only! You are welcome to share my projects but please always credit me and link back to my original post. Thanx! 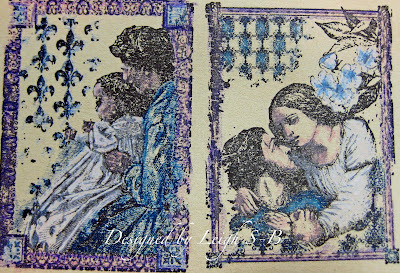 S&S Bloody Valentine Book - Page Two "Obsession"
MY DARK VALENTINE BLOG HOP Day 5 finale: Broken Hearts accordion book! You Make Me Happy - fancy fold Wedding card for Delicious Doodles DT! Shop my affiliate link with Blick Art Materials for the best deals on all your colouring supplies! We Won round #9! Smeared Ink Rocks! We Won round #2! Go Team Smeared Ink! Find That Stamp! 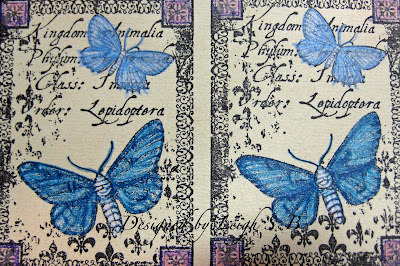 is a great resource for all Rubber Stampers! Come join us! 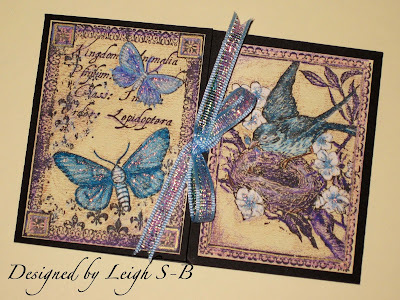 All Artwork, Tutorials & Photos on this blog are © Leigh Snaith-Brunton 1992-present. Theme images by suprun. Powered by Blogger.